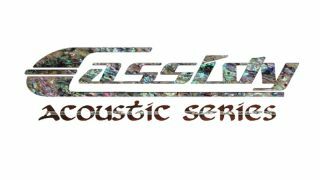 ACOUSTIC EXPO 2014: Hi, my name is Simon Cassidy and I am pleased to introduce you to our range of guitars and basses brought to you by our small independent family business from the North of England. Our Company has developed out of my busy guitar teaching studio and many years as a gigging guitarist which has brought me into contact with hundreds of guitarists, offering me unique insights into that common guitarist affliction - "gear acquisition syndrome". In addition to our standard range, we also produce a range of UK custom built guitars and basses. These are assembled by us in the UK using premium globally sourced products. We have made a conscious decision to deal directly with our customers in order to ensure consistent quality, excellent customer service and great value for money. So if you buy one of our guitars you will be dealing with me personally - I look forward to hearing from you. This guitar presents a striking all flame maple body with okume neck, maple headstock, veneer and abalone Inlay. Designed to suit players who prefer a slightly smaller body than the standard dreadnought. The solid spruce top and koa back and sides provide a light and punchy tone with beautifully ornate detail to the binding and Fretboard Inlay. This guitar includes a number of options built around our Premium All Solid Wood guitars designed to offer the highest possible materials specification, build quality, playability and tone at a price range within reach of most guitarists. For more information please visit the official Cassidy website, or connect with them via Facebook, Twitter and Instagram.